Knitted silkscreen polyester lanyards are a popular choice. 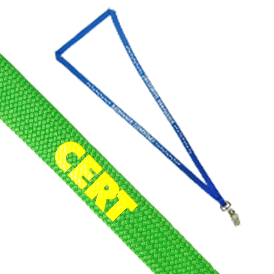 Our knitted silkscreen polyester lanyards provide a comfortable feel and excellent durability. Single color step & repeat imprint (one side only). Other attachments are available. Click here to view attachment options. For additional screen printed colors, add 0.18 (A) running charge and 30.00 (G) set-up charge per color. 4-color maximum. 16 working days after artwork or sample approval.